Ever since the notion that alien vehicles might be flitting around our skies first entered the public consciousness sceptics have demanded proof. Eye-witness testimony is all well and good; but who’s to say the witness isn’t a lunatic or a hoaxer? Many people will never be convinced until they see it for themselves. In fact there are many photographs of what appear to be aliens or flying saucers in existence. The reason not everyone is yet convinced is that there are doubts about their authenticity. Many of the still images show nothing but small dark specks in the sky, an effect which it is not difficult to reproduce in a variety of artificial ways. Two of the most famous UFO contactees, Billy Meier and George Adamski, have presented reams of both still photographs and motion pictures to the public as evidence of their encounters. While these images are certainly arresting, there is fierce debate about whether or not they are genuine. In recent years, camera technology has become increasingly cheap and accessible. More and more of us have camera phones or video recorders giving us the ability to take snapshot images at a moment’s notice. Many of these images are digital. And, unfortunately, along with the growing availability of digital image capture technology have come increasing possibilities for image manipulation. Photo retouching software is now readily available and whenever a new UFO image surfaces, you can be sure the claim that it was “Photoshopped” will not take long to make an appearance. As a result of the near ubiquity of cameras, nowadays, most modern UFO flaps – such as the Phoenix Lights or Bonnybridge - do result in lots of images. Most are low-quality, featuring grainy pictures and shaky-hand camerawork, but they’re certainly better than nothing, and the excited voices and reactions of those present help convey the drama of the scene. Thanks to sites such as YouTube, many of these are now readily viewable on the web. Interestingly, very few purported captures of UFOs on film have emerged from Western government sources. Though there is some fascinating footage of what appear to be UFOs on some Space Shuttle camera film, the anomalies were noted only by outside researchers, not by NASA itself. The most astonishing images come from Shuttle mission STS-48. These were broadcast live over the NASA Select TV channel and space enthusiasts recorded them in their own homes. Several “UFO events” have been noted in the STS-48 footage. The most remarkable shows an object moving slowly above the Earth. Suddenly it shoots off to the right into space. Moments later, something rockets up from below and passes through the spot where the moving object was only a second or two before. 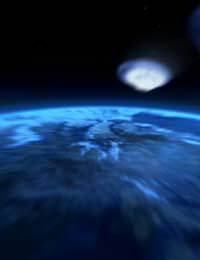 Many UFO researchers believe the film shows a UFO passing above the Earth, being fired at with either a missile or laser (presumably controlled by humans and either emanating from the ground or from a satellite) , then taking dramatic evasive action. It is curious to note that the live transmission of shuttle footage ceased after STS-48. One enterprising aficionado who managed a small community television station in Canada, however, found that he could pick up both audio and video transmissions from the Space Shuttles using a powerful satellite dish. He was Martyn Stubbs and he decided to record every second of the shuttle missions on videotape. In total, he recorded over 2500 hours of footage. Reviewing it, he noted some very strange things which some interpreted as evidence of UFOs. The most famous of these episodes concerns the so-called “Tether” footage from shuttle mission STS-75. In this mission, a satellite was being deployed into space, while still attached to the shuttle by a tether. At a distance of about 13 miles, the tether broke and began to drift away. The astronauts were asked to take film of it. The film shows a mysterious disc appearing from off-screen and flying beneath the tether. Many clips from these NASA missions can now be found easily on the internet. UFO buffs hail this as proof of an extra-terrestrial presence. Sceptics dismiss them as no more than random space debris, ionised dust, or imperfections in the camera equipment. While governments in Europe and North America seem uptight about the UFO subject, governments elsewhere seem more open-minded about it. In 2004, for example, the Mexican government released some extraordinary film which had been captured by pilots of the Mexican air force. On a routine drug interdiction patrol, the pilots picked up something on radar which they were unable to see with the naked eye. When they used infra-red detection equipment, however, they saw what appeared to be a flight of ten or so disc-like UFOs, flying information. The voices of the aircraft crew can be heard on the tape expressing amazement at what’s occurring. “We are not alone,” one of the crew members says. There is truly a staggering volume of images, both still and moving, which appear to show anomalous objects in our skies. As yet, none has yet been so unimpeachably compelling as to overwhelm the accusations of hoax or the explanations offered by sceptics, and convince everyone that the phenomenon is real. We can only hope that as camera technology improves and becomes omni-present, definitive proof will soon emerge.